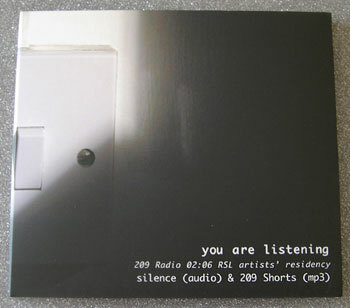 Sound Art intervention within 209Radio's RSL (Restricted Service License) FM broadcast to Cambridge for 9 days in February 2006 involving the RADIOTAXI team : Kirsten Lavers & Simon Keep as (ACE funded) artists-in-residence with cris cheek and Karl Hartland. A curated programme of sound art and 209Shorts* throughout the week culminating in a weekend of themed radio on "Noise" and "Silence". 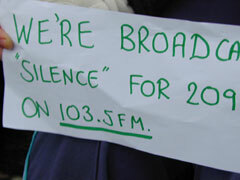 Including a series of "Silent Interviews" with 209Radio volunteers. 209Radio is a broadbased volunteer run community radio station for Cambridge distinctive in its support of artists working with the medium of sound. 209Radio currently webcasts 24/7 from www.209radio.co.uk and has recently been awarded the Ofcom 5 year community radio FM license for Cambridge - due to go on air in Spring 2007. FINAL DESTINATION LIVE RE-SCORE : 2:03:06 Live Foley to Channel 4's transmission of Final Destination including adverts. Foley Orchestra: Simon Keep, cris cheek, Kirsten Lavers, Karl Hartland, Peter Owen and Jimmy Possession. Radio Art Discussion + mix : 1:53.04 Live studio chat with Kirsten Lavers, Simon Keep and cris cheek chaired by Jimmy Possesion.